Gabby Frost in a Buddy Project shirt she designed. 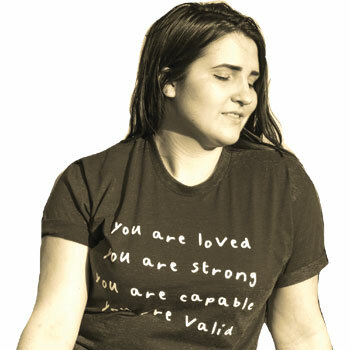 Since she was 15, Gabby Frost, a junior music industry major in the Westphal College of Media Arts & Design, has been running Buddy Project (buddy-project.org), a nonprofit she founded that pairs young adults struggling with mental health issues with available resources, support and “buddies” to talk with online. After seeing for herself how people talk about suicide and mental health issues on social media, Frost started Buddy Project by creating a Google Doc that people could add their names to in order to be paired with a “buddy” to chat with on Twitter or Instagram based on similar interests and ages. In the first 12 hours, over 3,000 people signed up. Today, the number is over 225,000. Buddy Project has grown offline to include a campus rep program in which volunteers in middle school, high school and college spread awareness about mental wellness on their campuses. “I’m hoping that in the future, more people are open to talking about mental health and supporting platforms that foster those conversations,” she says.